The Farm to Table Fun(d)raiser, in its fifth year in 2016, celebrates the local food movement and promotes awareness about county-wide sustainability efforts, while raising money to fund them under the auspices of the Mercer County Sustainability Coalition. 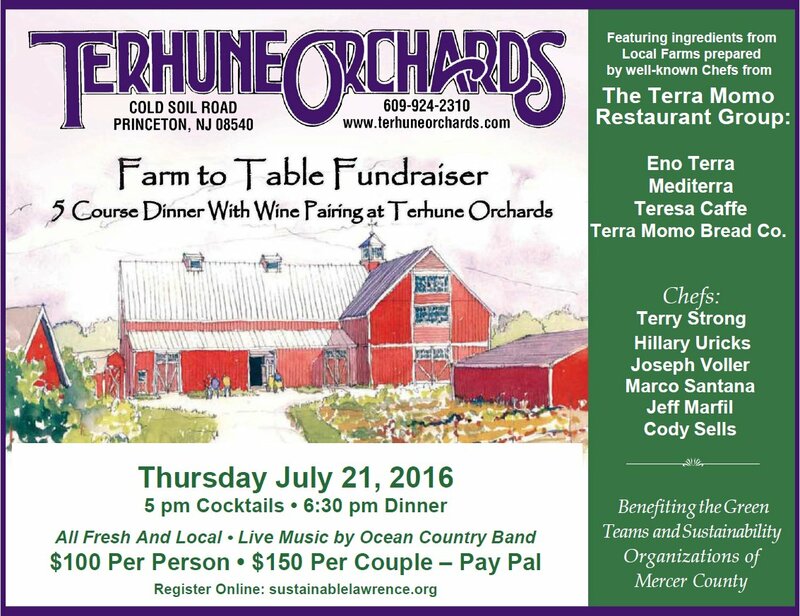 The event features fresh ingredients from local farms prepared by the well-known chefs from the Terra Momo Restaurant Group, paired with Terhune Orchards’ award-winning wines and live music. Diners are treated to an overview of each course by the chef that prepared it, as well as an explanation of its wine pairing by Gary Mount of Terhune Orchards. Diners are sent home with local produce grown right on the farm. This year’s celebration at was held on Thursday, July 21, 2016 from 5-9 p.m. We are delighted to share the menu and recipes with you below. Terra Momo Restaurant Group- We regard the farmers and artisans who produce our food as partners in the creation of a great culinary experience at all of our restaurants; Mediterra, Eno Terra, Enoteca Ursini, Teresa’s Caffe and Terra Momo Bread Co.
Terry is self-trained and has developed his skills hands-on over the last 17 years in all of the Terra Momo locations. He is currently Executive Chef at Mediterra Restaurant. Joe graduated from the Art Institute in Philadelphia. He trained in Philadelphia and worked in Florida before taking his current position at Eno Terra. He is recently married with a baby daughter. He finds inspiration in the traditions of the different provinces in Italy and the best local farms in New Jersey have to offer. Marco has worked at Eno Terra for 5 years. Here he worked with Chris Albrecht, learning all the stations, then becoming Sous Chef. Jeff attended culinary school at Hudson County Community College. For 3 years he worked as a cook in several Central Jersey restaurants before becoming sous chef at Mediterra Restaurant and Taverna last year. Hillary is a graduate of the Culinary Institute of America (CIA) She has worked at such notable locations as Maialino with Danny Meyer and with Jose Garces in Atlantic City and Philadelphia. She currently works in the Mediterra kitchen as the Pastry Chef. Cody began his career in restaurants working for the top brewing company in Michigan, where he developed his interest in craft and artisanal food and beverage. He is the beverage director for Mediterra Restaurants and Taverna. Terhune Orchards, 200 acres of fruit, vegetables and vineyard owned and operated by Gary and Pam Mount and their daughters Reuwai and Tannwen. The farm is recognized as a leader in sustainable agriculture practices and community engagement. They host seasonal farm festivals and welcome visitors to the farm. The farm store and winery are open year round. The Mercer County Sustainability Coalition is an alliance of the Green Teams and sustainability organizations of Mercer County, New Jersey and the Mercer County Office of Economic Development and Sustainability. The Coalition works to promote a regional and collaborative approach to sustainability initiatives. Just Peachy– Fragrant fruity wine. The essence of summer. A blend of our Apple Wine with peach. Used in the Peach Wine Slushie. Apple wine– A refreshing medium-dry wine made from Terhune Orchards own apple cider. Vidal Blanc– Medium-dry, smooth and fruity white with hints of citrus, lemony flavors. Farmhouse White – A dry white table wine, light with hints of pear and a smooth finish. Estate grown blend of Sauvignon Blanc. A blend of Chardonnay, Sauvignon Blanc, Riesling, Vidal Blanc and Chardonelle. Chambourcin– Medium body, dry red wine with a clean finish, taste of cherry, plum and blackberry. Full of fruity notes with dry Chianti characters. Barn Red– Full-bodied blend of Cabernet Franc and Cabernet Sauvignon. Warm cherry and strawberry aromas with a smooth finish and soft tannins. Perfect with your favorite beef dish or steak. Estate grown. Blossom White– Outstanding grape flavor with fragrant notes of honeysuckle. Sweet, clear finish. Semi-sweet blend of Vidal Blanc and Niagara grapes. Cut the corn kernels off the cob. Deseed the peppers and quarter. Quarter the tomatoes. In a blender, pulse in small batches to combine the corn, tomatoes, peppers, shallots and vinegar. With the blender running, add the olive oil in a slow steady stream through the opening in the blender lid until the soup has a smooth consistency. Served chilled. Slowly whisk the olive oil into the vinegar and mustard. Season the vinaigrette with salt and pepper to taste. Place the radishes, tomatoes, garlic scapes, and cucumber in a bowl and dress with 2 Tbsp. of the Balsamic vinaigrette. Plate the salad with a ball of mozzarella per serving. Cut the jalepeno into rounds and put in a small bowl. Heat the water vinegar and sugar to dissolve sugar. Pour over the jalapeños. Allow to cool completely. In a food processor, blend the charred onions and scapes or 2 cloves grilled garlic, with a little olive oil to make a smooth puree. Season with salt and pepper and fold into sour cream. Preheat a charcoal or gas grill. In a bowl marinate the fish with the olive oil, lime juice, zest, cilantro, chile powder, salt and pepper. Cover with plastic wrap and refrigerate for a half hour. Prepare the slaw, pickled jalapeño and crème recipes. Refrigerate until you are ready to serve. Wrap tortillas in tin foil. Warm them in a 300 degree oven for 5-6 minutes. Lightly oil the grill grates. Cook the fish 1-2 minutes per side. Assemble tacos with fish on top of the warmed tortilla, then the slaw and some crème on top. Garnish with pickled jalapeno. Smear mayonnaise on corn, sprinkle with cilantro, cotija cheese, and chili powder on top to taste. Serve with a lime wedge. In a bowl whisk together the flour, salt, baking powder and baking soda. In another large bowl, whisk together the sugar, vanilla, eggs and oil. Fold in the shredded zucchini until combined. In three additions, whisk the flour mix into the wet ingredients. Fold in the blueberries. Spray and flour a bundt mold or 9” cake pan and pour the batter in. Bake for 20 minutes. Then rotate the pan and bake for another 15 minutes. Let the cake cool completely before removing from the molds. In a small sauce pan, combine the sugar water, vanilla beans and lemon zest. Bring to a boil. Make sure to stir every so often. Pour into a heat proof container to cool to room temperature. In a small sauce pan, bring the water and sugar to a boil. In a 13×9 pan, layer the lemon rounds to slightly overlap like shingles. Slowly pour the sugar water over the lemons, making sure they don’t lose formation to much. Place a piece of parchment right on top of the lemons and cover the pan with foil. Bake the lemons for 1 hour. Let them sit at room temperature to cool down and then store in the fridge with some of the liquid. Assemble the Dessert Cut the cake to your desired size. Drizzle the lemon vanilla syrup on top along with some fresh blueberries. Finish by adding the candied lemon rounds. SJ's Sustainability Summit June 14, 2019 at 8:30 am – 4:30 pm Bell Works, 101 Crawfords Corner Road, Holmdel, NJ 07733, USA More details on sessions and registration link to come. Post Summit happy hour with NJ's sustainability community begins at 4:30pm on the 1st floor of Bell Works. Cash bar.